In the decade-plus that University of Alaska, Fairbanks, professor Matt Nolan has studied the impacts of a changing climate on Alaska’s McCall Glacier, he’s grown accustomed to the logistics of researching glaciers: cold and short field seasons, inclement weather, and more. Operating efficiently in the field at as low a cost as possible is paramount to Nolan and his colleagues. So last summer he devoted several weeks to engineering technology to generate more accurate, detailed maps of the region faster for a fraction of the price. 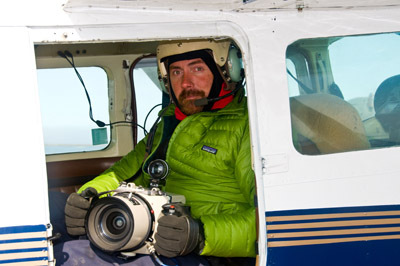 Specifically, he spent several weeks in the skies above McCall Glacier testing a new methodology he developed to create topographic maps of the area using DSLR cameras. The National Science Foundation supports his research. Time-series measurements and maps are important tools for scientists tracking glacier change. But often collecting such data involves expensive technologies like airborne LiDAR, a laser remote-sensing technology that scientists use to map landscapes and observe changes. 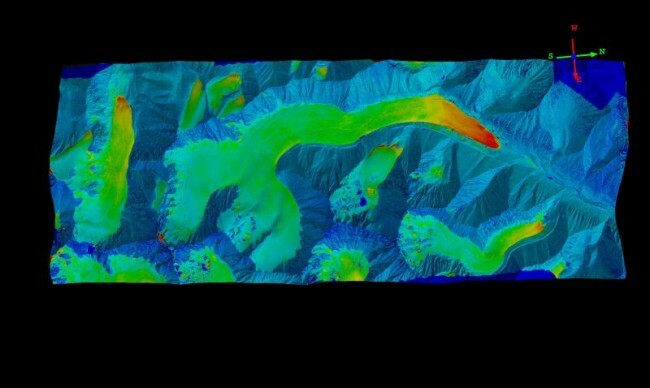 However, integrating LiDAR data collection in to a research project can cost anywhere from $400,000 to $1 million to purchase a unit suitable for mapping mountainous landscapes. Once acquired, the technology requires additional ground control data collection. This involves surveying fixed points—a boulder or a building, for instance—to tie the data to real world coordinates. This part of the LiDAR mapping process is labor intensive and adds yet another layer of expense. Nolan’s innovative camera system can create a more accurate, higher-resolution map that does not require on-the-ground accuracy testing. Better yet, it costs roughly $15,000, an order of magnitude cheaper than LiDAR. It’s also a faster process; in the past, commercial vendors took months, or even years, to deliver LiDAR data of McCall Glacier to Nolan, who can now do it in-house in 24 hours, including data collection, processing and analysis. “In some sense it’s just doing the same thing but better and more efficiently. But because it is so much better and more efficient it allows us to do brand new things,” he said. This summer, Nolan cut a small hole in the floor of his plane and mounted the camera to the bottom with the lens facing downward. He then connected the camera to an intervalometer, a device that activates the camera to take pictures at a set interval. The next step was to plan the flight route to make sure he covered the area thoroughly and upload the points he wanted to cover in a hand-held GPS stationed on the dash of the plane. 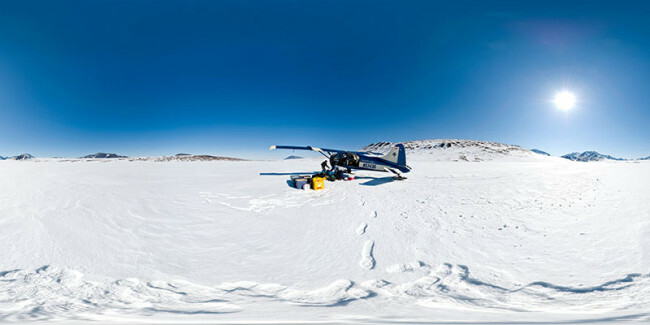 It took Nolan about an hour to fly over McCall Glacier and collect the photos he needed to make a map (by contrast, the flight to simply reach the glacier took four hours one way from Fairbanks). He started the data processing that night, and by morning it was completed. A key test for the system was to see how the new maps produced by the photos taken with a DSLR camera compared to older maps of McCall Glacier that Nolan created using LiDAR data. One challenge Nolan faces with his method is managing the massive data files. But that challenge is not holding him back. Nolan is still testing and fine-tuning the camera system both in the air and on land whenever he has the opportunity. 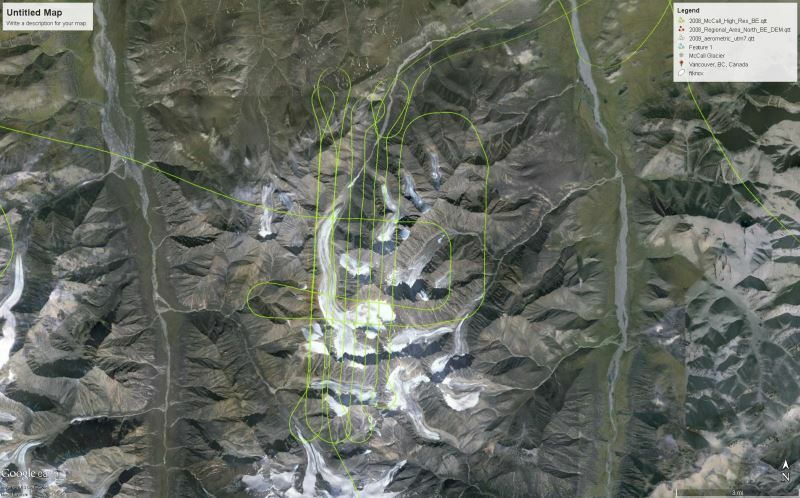 Tests completed after the September trip to McCall Glacier at a nearby open-pit gold mine show just how well these maps can show change on a variety of time scales, even day-to-day changes at an active mine. Nolan hopes his methods of making cost-effective, highly accurate maps can be applied to a variety of scientific pursuits ranging from coastal erosion and glacier retreat to tracking animal populations. This fall and winter Nolan will test the system to see if the imagery it generates can measure snowfall. He also sees this tool being useful to National Park Service managers in Alaska who are always looking for ways to locate and track caribou. In fact, he recently made topographic maps of caribou herds with the camera system and sent it to park rangers and mangers, who were astounded.